A few olive trees, some possibly over 1,000 years old, cling to life the heart of the barren Negev – barely. 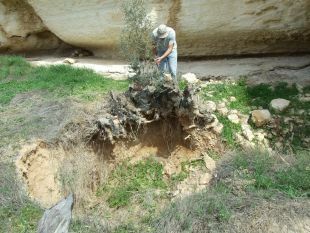 After several winters with even less rain than usual, the olives of ancient Shivta are in horrible shape. Whole branches are dead and bugs are boring in. Now a scientific team including experts from the Volcani Institute of agricultural science, archaeologists from Haifa University and ancient DNA experts from Tel Aviv University are mounting a last-ditch rescue. Saving the trees of Shivta, a village apparently founded during the Roman period and which flourished during the Byzantine era (5th-7th century C.E.) involves trimming their canopies to minimize water loss from respiration, and rebuilding the ancient water collection systems, including channels, dams in the wadis, and extensive storage. 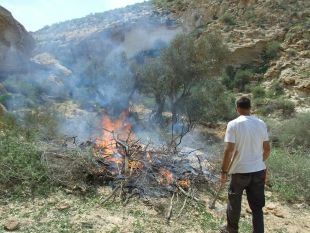 But even this labor of love won't save the ancient trees if the Negev goes hyper-arid. The olive trees, which were planted by dams in the Zeitan streambed, are a cultural remnant of ancient agriculture, suggest archaeologists Yotam Tepper and Guy Bar-Oz of Haifa University. 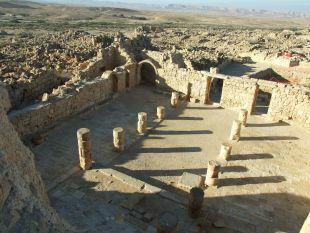 Indeed, archaeologists were astonished to realize, in recent years, the extent to which the Arabs and Byzantines managed to flourish in the heart of the barren desert, thanks to efficient water harvesting and storage – including through steep runoff agricultural channels down the stony hills, dams, and terraces for farming, Tepper explains. Olive trees are remarkably tough. If cared for, they can survive for centuries on end, anecdotally over a thousand years. The trees at Shivta could even be the actual ones planted by the Byzantine farmers during the village's heyday some 1500 years ago, or offspring of those trees. We can't know because with all due respect carbon-14 dating, it's impossible to reliably date living olive trees, aver olive experts Arnon Dag and Oz Barazani of the Volcani Agricultural Institute. "The ancient tissues at their core degrades in time and vanishes," Barazani explains. "All that remains is the younger tissues. The age of olive trees is estimated, very vaguely, by the tree's girth." Shivta existed for 700 to 800 years, peaking in the 5th to 7th centuries C.E., the late Byzantine period. Come the Early Islamic period, the settlement sank into decline and was apparently abandoned in the early 9th century, as was its olive grove (with all of four trees) that somebody, some time during that history, had to have planted near a dam the village-folk built in the Zeitan Stream. Natural, they were not. Olives are a Mediterranean tree, not a desert denizen. The olive wants balmy climes and fertile soil, not burning sand, loess and stone. Also, olive trees do not thrive with irrigation, explain the scientists. They like natural rainy seasons. 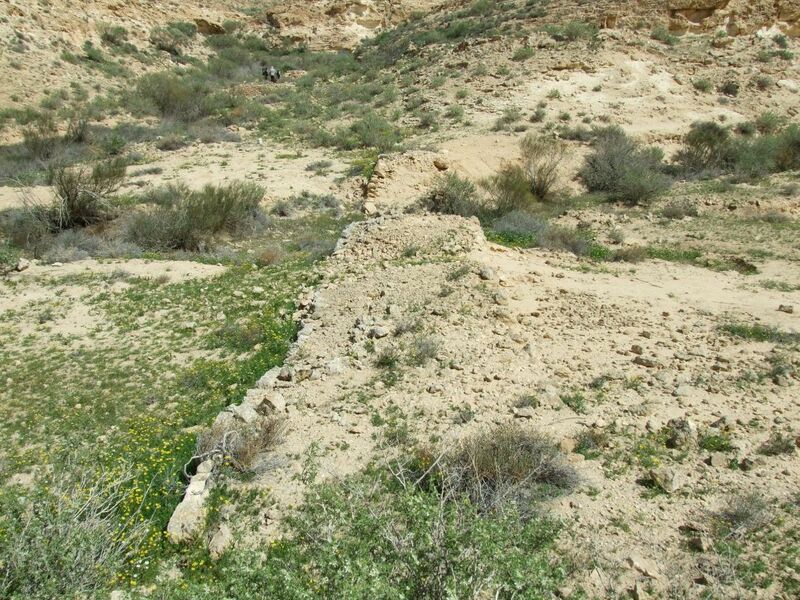 So they didn't sprout up independently in the Negev, and once planted there, they needed coddling. Yet they have survived hundreds of years since Shivta was abandoned, or their offspring did. Why after they flourished untended for all that time, do the scientists now need to trim their canopies? What happened? For one thing, the runoff agricultural systems which shunted water and soil to the dams in the wadi date back to the Byzantine period, don't work as well as they used to. 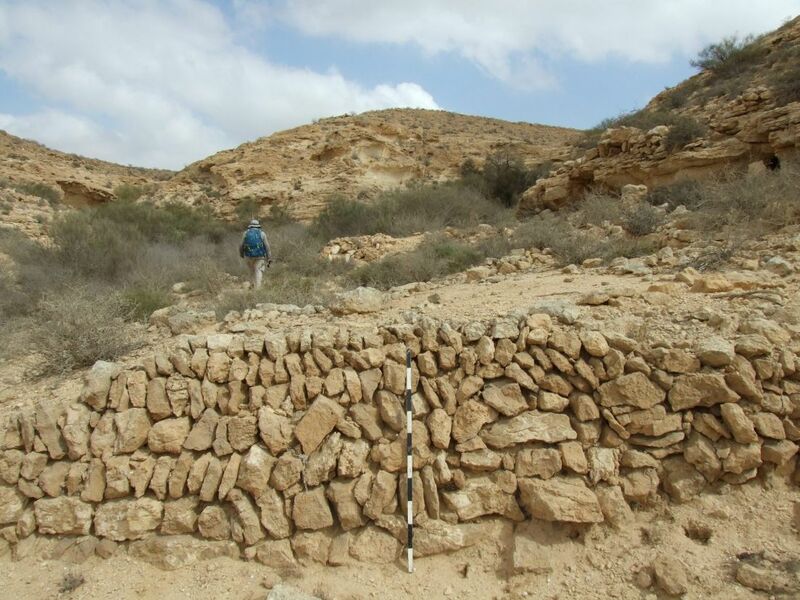 They haven't been maintained since Shivta (as well as other settlements in the Negev) was abandoned some 1100-1200 years ago, Tepper tells Haaretz. Worse, precipitation in the Negev has been declining for decades, from a pretty sorry average to begin with of about 100 millimeters a year. Some years are rainier but the trajectory has been downward. Lastly, Dag suspects that the trees did get some attention all these centuries, from Bedouin nomads, but they've been left to their own devices for decades. In general, climatologists warn that climate change is likely to exacerbate the desertification of the Sahel and Middle East, as well as southern Eurasia. 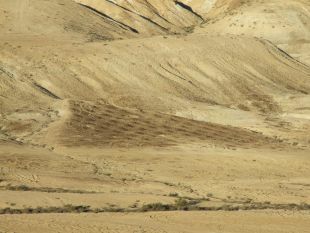 The Negev's aridification could be a fluctuation, or a result of climate change. We won't know for a very long time. Either way, why even try to preserve these trees, with all due respect to their antiquity? It isn't as though the olive is even native to the place. Because. Also, "The olive is the plant that is most representative of Israel," Dag says. The Great Shivta Olive Study of the village's four specimens is part of a wider survey of around 300 ancient olive trees, each tree exceeding 2 meters in diameter, says Barazani – in the Galilee, Jerusalem and Shfela. What the scientists set out to study is the plant's domestication. "It turns out that 90% of the ancient olive trees in Israel are a single type, apparently the Souri," Barazani says. Three of the olive trees at Shivta were Souri ("Syrian") and one seems to be the "Jerusalem" subspecies, which seems to be older (going by molecular clock) than the Souri version, Dag says. It turns out that the ancients knew how to better a crop by grafting: In 85% of the ancient trees, the rootstock and canopy belong to different varieties of olive, Barazani says. Dag also points out that it's hard to get the Souri tree to grow. If you have one good one, you take branches from it and graft them onto other rootstock. It seems the feral olive was first domesticated in our area, meaning Israel-Syria-Lebanon, about 5,000 to 6,000 years ago, Barazani and Dag tell Haaretz. Spain, which is today the biggest producer of olive oil, only began cultivating the olive about 2,000 years ago, Dag adds. A study published in 2014 found the remains of olive oil adsorbed to the bottom of pottery jars in Ein Zippori, dating back 8,000 years. 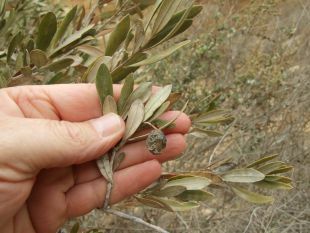 That oil would have been made using the wild-type olive, Dag explains, which were beady little things about the size of a green pea. Wild olives produce little oil – about 5% of their volume compared with 25% for today's domestic olives. "Clearly the ancients carried out selection, and grafting, over a great many generations," Dag postulates. Almost all olive trees grown around the world today seem to be domesticated versions. There are some trees still existing here and there in the Galilee and Israel (and who knows what's in Syria or Lebanon) with tiny bitter fruit that might be the Real Original Wild Olive, but actually we cannot know, Barazani points out. The domestic trees may have "infected" the wild species with domestic characteristics and prevailed. Which means that maybe the original olive had some marvelous characteristics that we have lost. But maybe those lost traits, if any, will come to light as work on the history of the olive progresses. All's well, except that there's no prediction for rainfall in the Negev to necessarily pick up in years to come, as a trend. "At worst we'll truck in water for the trees," vows Dag. "The main thing is for them to survive."